Last Friday I got a unique opportunity to travel back to the Holy Land. Being a computer geek and developer for the past 20 years, I am of course, referring to Silicone Valley, Mountain View in particular. I got to fly out and meet with Google at their headquarters in Mountain View. Talk about Déjà vu! When I walked onto the Google campus, I had a total flashback to 1987. No, this wasn’t like a 1960’s flashback. This is when I started traveling back to visit with Apple Computer in the eighties. Google so reminded me of Apple in the old days. The college campus look, the industrial college type buildings with their stark Ikea type furnishings, and even the college age employees all in their jeans and sweatshirts. Only the logos on the shirts had changed over the last 20 years. The most startling memory of all was Google’s use of primary colors. Everywhere were bright red, yellow, and blue spheres, lava lamps, chairs, and other colorful decorations. Where Google uses spheres, Apple used Apples, but all bright simple colors.Remember Apple’s color in the days before Apple dropped the word “computer” from their name and switched to their use of clinical white? Until their resurrections, they were always represented by the colors of the rainbow. As a sidebar; was it only me or did anyone else notice that Apples rainbow color scale was out of order? Does this make me a really big geek? At Google the under thirty employee preference was also prevalent, just as it was at early Apple. It was difficult to tell whether it was Google, Apple or ASU. Just like the days at Apple, you can feel the atmosphere of creativity at Google. It was everywhere, it permeated the air. You could “feel” the energy. You just knew that in every building, on every floor, someone or someones were working on something that is about to change the way we interface with the world around us. The only major difference I could see was their use of Naked Juice. There was Naked Juice everywhere. When I first began traveling to Apple there were the “Two Steve’s” popcorn machines on every floor, really. They actually had full time employees whose only job was to move from popcorn machine to popcorn machine making sure they were always full and fresh. When John Scully took over it was a sad time for me. The popcorn machines disappeared and Peanut M&M appeared in their place. I don’t like peanut M&M’s. After my meeting I still had 8 hours before my flight home took off. I alsked my partners if we could continued on our pilgrimage over to The Computer History Museum, which is walking distance from the Google Headquarters. It was the first time I’ve ever visited the museum.When we arrived unannounced, Allison Akbay, Registrar, was incredibly kind to take us on a tour of the museum and explain all of the unbeleivable items they have there on display. For the first time in my life I got to see all of the computer technology that I’ve only read about. I saw the ENIAC! Can you imagine? The ENIAC! The First Cray! An IBM 360! The first hard drive that was four feet in diameter and held a whopping 10 megabytes. Core memory! And a lot of other technology that changed the world. It is an incredible collection. Even walking the time line wall and seeing a Texas Instrument 55A, a Commodore 64, the first HP handhelds, and some of the earliest Apple Computers was a total rush for me. I spend 1000’s of hours programming these early machines and haven’t seen them in two decades. Does anyone remember COBAL, ForTran, and RPN? It was like going to my high school reunion. Yes, were looking a little worse-for-ware and were all showing signs of aging… just a little. It was a particularly proud time for me to think that 14 of my inventions now lived with these industry icons.Just to have my inventions in this company was truly an honor. It was an emotional moment for me. From there we continued on our Journey of the Holy Land by searching for the Holy Grail. I had a few hours remaining and wanted to see if I could verify, where my “First Computer To Save A Human Life” now rested. 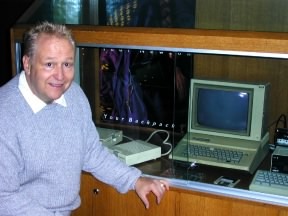 This computer with serial #0002 was sold to Apple back in the mid 1980’s and was on display at Apple’s headquarters in Cupertino. In the lobby of their building on “Infinite Loop” (I just love their road name), they had a museum of their own. In glass cases there were many of Apple’s World Firsts. Among these iconic items was my SoftVoice Computer System for the Disabled. This Apple //e was on display until the return of Steve Jobs. As legend has it, Steve walked in to the lobby one morning, looked around and shouted; “Get this sh#$ out of here! It looks too cluttlered!”. The staff was aghast! You can’t “Get rid” of Apple’s World’s Firsts! Steve insisted, “Get rid of it!” You also can’t argue with Steve Jobs. As not to loose these items for eternity, someone in Apple Facilities talked Stanford University into talking the items and displaying them throughout their buildings. 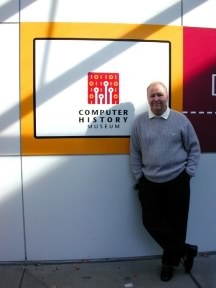 When I began working with The Smithsonian Institution and The Computer History Museum several years ago, I researching items they could add to their collections, I contacted Apple to verify the whereabouts of the computer described above. It was then I heard the story of Steve’s Spring Cleaning Rant. After making dozens of random and dead end telephone calls to Stanford, I finally came across someone who thought they has seen it. He got my email address and within 15 minutes, I received several camera-phone photographs of what he described as the missing Grail. There wasn’t any signs saying it was the first computer to save a human life and the voice recognition boom mic was also absent, but he was sure this was it. 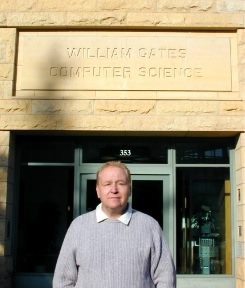 There was one ironic twist; this Apple Compute resided in the William Gates Computer Science Building. It just seems funny. So off to Sanford we headed. I could almost here the theme to “Indiana Jones” playing in my head. We parked and asked directions to the Bill Gates Build (who says men don’t ask for directions). We found the building and headed for the fourth floor where it was supposed to reside. I stepped out of the elevator and there it was, in a glass case with some other Apple Computers. It was all beat to he#$, some keys were missing, and it had yellowed over the past 20 years (but, haven’t we all). There it was! The first time we had been in the same room for more than two decades. It was cool to see it again. There was no definitive proof that this was the actual machine; only hearsay and folklore, but that’s all I had to go on. It was still a sentimental moment for me. If by chance anyone does know if this isn’t the original Apple //e SoftVoice or knows where the real one is. Please email me. In the mean time, my Journey to the Holy Land was rewarding, spiritual, and something I will not ever forget. The best part was I got to share it with my two best friends.